As so many of you are now planning your 2019 trips, we thought now is a good time to steer you away from doing something really silly the first time you collect your motorhome. When planning or setting off on your trip, you may not have acclimatised to your new leisurely pace of life and could be tempted to head straight from our depot to the other end of France or even another country. DON’T – it will get you off to an unnecessarily stressful start! Many embarking on a long European adventure seem to finish up arriving to begin their trip a little later than they originally planned. Whether your house sale was late concluding, your daughter had triplets or your company needed you for just one more week, no matter how far ahead you choose your start date, life has a habit of pushing it back. Having witnessed the stress that a late arrival followed by a hasty thrash across Europe to keep an unmoveable date can cause, we’d like to suggest you build in some slack when you make your plan. Don’t forget, you are coming for a long trip and can afford to ease yourself in gently. You don’t have to meet friends in Copenhagen then attend golf lessons on the southern coast of Portugal in your first two weeks! There are plenty of pretty, historic villages to explore near our depot, this is Noyers sur Serein. Everything to do with breaking in a new motorhome in an unfamiliar country takes longer than you imagine. It takes time to figure out how everything works on your campervan, where to buy things, fill up with fuel, eat or stay overnight. Even your regular supermarket shop can take hours when everything is in French and you are trying to discern the difference between beef and horse steaks (!) or full-fat and semi-skimmed milk. You have to adjust to different customs, road rules, motorhome etiquette and not least of all, how long it takes to get things done in a country with a 35 hour working week (Phill and I are 18 years into that one and it still catches us out). We advise staying within about 80 kilometres of our depot for your first five nights so you can call in and see us if you can’t figure out how something works. Try to avoid having a tight deadline to be hundreds of kilometres away immediately after that too if you can. We are based in one of the most beautiful regions of France with many wonderful things to see and do all around us. We are literally surrounded by famous wine regions, bucolic landscapes, historic cathedrals, grand chateaux, medieval villages, weekly markets and sophisticated cities. It is all right here on our doorstep along with probably the best facilities for motorhome travellers in Europe. The Eurocampingcars depot is surrounded by medieval chateaux. 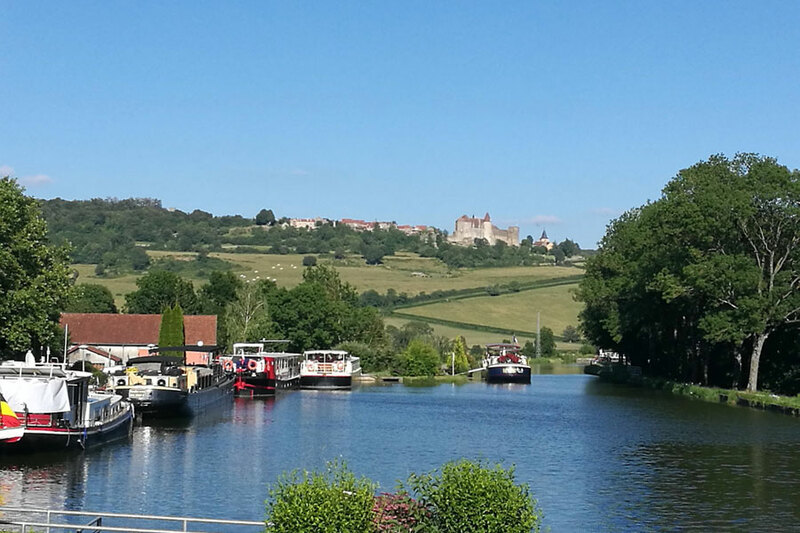 Our advice is tried and tested and the feedback we get from clients who have started their trips by gently exploring Burgundy or Champagne has been unanimously positive. Don’t pick up in Burgundy and rush off, stick around for a relaxed start to your trip, get to know your new home and see one of the loveliest parts of France at the same time. We’ll be offering more pearls of wisdom on how to enjoy a smooth start to your trip soon but in the meantime, get in touch if you’d like us to guide through the process of owning a motorhome or campervan in Europe. Perfect produce at the market every Wednesday and Saturday in the nearby, riverside town of Joigny.